Molly's Room: A narrow room grows up. We've worked with Molly when she was younger, but she's all grown up now. We wanted to create more space for a teenager to hang out with her girlfriends, explore her creativity, be studious, and get a good night's rest. 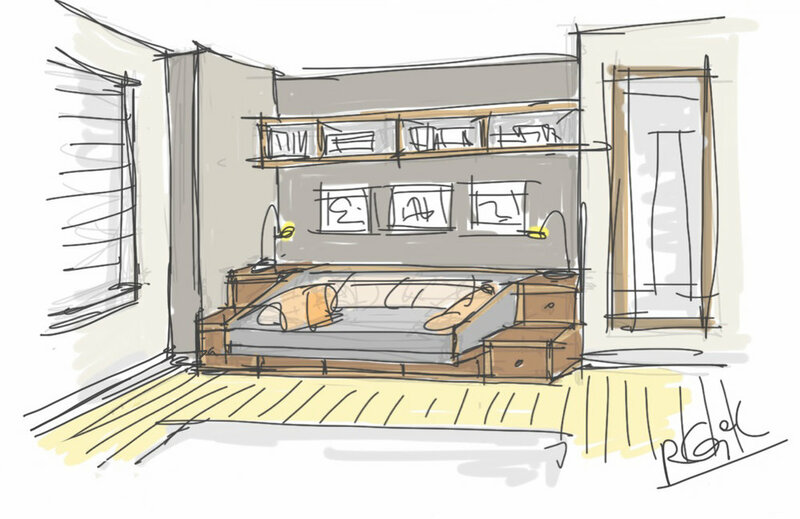 We designed the room with a day bed on one side with a hanging shelf above, and a floating desk on the other side of the room. The low day bed has drawers underneath and is flanked by two night tables. The floating desk gives an illusion that the room is bigger than it really is. The shelves overhang the vertical support making it appear lighter in the room. Nine storage drawers to keep notebooks, pencils, and gadgets tucked away nicely. Molly went for an adult color palette of walnut and gray. Natural woods kept the space bright, airy, and grown up look. Molly’s old room features a loft bed equipped with our U-shaped staircase. This will take you to her old room.